Scattered about Northwest New Jersey are many historic churches and schoolhouses that now serve as headquarters for local historical societies or stand as historical monuments to the simplicity of times past. Others of these structures have found a new lease on life as private residences. While the architectural remnants of the past have been preserved to varying degrees by subsequent owners, these unique homes all continue to evoke the allure of their past roles. Whether it's the graveyard, the church bell, the outhouse or the remnants of coal-stoked fires, these three restored homes have brought the past to life for their current owners. Just down from the general store and across from the old schoolhouse a graveyard sits prominently. The cemetery continues to serve as burial grounds for the community, as it has done for over 175 years. The oldest headstones sit closest to what once was the Methodist church. Today, those historic grave markers sit a mere two feet from the backdoor entry of the Foster's home. The local Methodist congregation built the church around 1827. It remained in use as a church until around 1911 when the congregation, due to declining enrollment, found it sensible to consolidate with the nearby Hainesville worshippers. The building was used for some time as the Sunday school, and local folk still recall attending religious classes and community events in the building. Jason Spagenberg, a lifelong resident who lives next door to the old church, is a member of the cemetery association which now owns and operates the graveyard. He recalls that an addition, built in the 1920s, held Sunday school classrooms. Because the one-story lean-to type addition sits only feet from the oldest graves, there was some controversy over its construction, Spagenberg says. There was no plumbing in the building. There were dual staircases along the external walls, leading up the second-floor balcony. The balcony was three-sided, and served to accommodate extra people. "The whole thing was a focal point for the community. At Christmastime, the school kids had programs there," Spagenberg recalls. After serving the community as a church and Sunday school, the building went through several owners as it sat vacant for decades. At least one previous owner attempted renovations, gutting the interior of the building to the rafters. Altars, pews, and most remnants of its life as a church were lost. However, the exterior of the structure remained familiar. The two-story rectangular building, with double front entry doors was recognizable as a former church. Current owner Ted Foster happened upon the purchase of the building almost accidentally ten years ago. "It was affordable," he said laughingly of his purchase of the "empty, dilapidated" shell of the old church. "I actually saved this place from being demolished." Foster, a life-long Sussex County resident, is a skilled carpenter. He breathed life back into the old church, converting it into a residence filled with his own handcrafted cabinetry and furniture. Although the home is thoroughly modern, the skilled one-of-a-kind craftsmanship of Foster's creations reflects back to the days when handcrafted was the norm. It is not difficult to forget that you reside in an old church when your windows overlook a graveyard. A large, intricate memorial to Francis Layton, 1829 - 1900, resides just outside the side window. 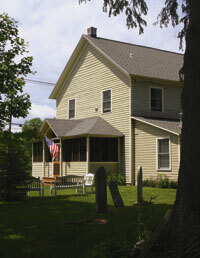 Visitors to the Foster home are greeted by Ann C. Powell and Rebecca M. Schumo, both deceased, since 1890 and 1880 respectively, and whose gravestones prominently sit at the end of the home's driveway. Foster and his wife, Hadley, say that there are no ghosts here. But the past remains a constant presence in other ways. The double front entry doors remain, but have been converted into glass doors that now open onto a porch, rather than a stoop. One of the stairways to the balcony has been rebuilt in its original location, and is used to access the second-floor living quarters. The balcony has become a full second story. The large downstairs room, which served as the main part of the church, has been divided by a wall. A door now stands behind where the altar once stood, and leads to the new addition Foster is adding to the back portion of the home. The Sunday School lean-to addition remains intact. "Now we have inside plumbing," Foster joked, as he pointed out the original outhouse - a two-seater- which now serves as a garden shed. The outhouse had two doors, one on each end, to designate the women's and the men's facilities. Although much has changed, the Foster's feel a close connection to the history of the building. Hadley Foster's family is from the area, and many of her relatives attended church and Sunday school services in what is now her home. The final resting place of her great-grandparents is just a quick walk out the back door. "You have to wonder who got married in here. I'm sure its been through a lot. A lot of things happen in churches," Foster said. "It's kind of neat. It just kind of happened," he said of their living in a historic building, complete with family ties for Hadley. "This was destiny." The circa 1835 building is now home to the Wooldridge family: Lorna, Phil, and their son Jack. It is quite fitting that Jack is home-schooled; his home was once a one-room schoolhouse in operation for over 100 years. The Free Union School, once known as No. 66 in the Warren County School District, graduated its last class in 1945. The K-8 schoolhouse, which seated 40 in the 18x20 one-room building, was heated by a large pot-bellied stove. It is now a fully-modernized four bedroom home, complete with heating, electricity and indoor plumbing. Yet the history of the home is palpable. From the dirt-floored basement to the spot in the yard where the outhouses once stood, this home is inhabited by the spirit of learning that its four walls embraced. The entrance to the schoolhouse was at the side, through what is now the laundry room window. There were three large vertical windows front and back, one of which is now the front door. And the spot where the pot-bellied stove, first heated with wood and later coal, stood is now a staircase to the second floor. Although the second floor is original, there was no stairway access. The Wooldridges have yet to figure out what purpose this space may have served. The desks and the chalkboards that graced the chimney-side wall are long gone. The coat hangers and shelves no longer exist, nor do the bookcase or the teacher's large desk. They were sold at auction following the closing of the school. But the memories, along with a few artifacts, remain. Coal, old window latches, and a charred basement beam are all relics of the house's intriguing past. That past is a good part of the reason why the family chose to live in the schoolhouse, which had been converted into a home around 1950. 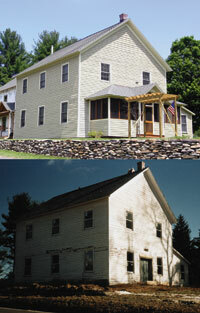 An addition was eventually added, the original siding was covered with vinyl, and the slate roof became shingled. But the Wooldridge family knew that the home, despite its renovations, was an integral piece of local history. "One of the neatest things is the people we meet that went to school here," Lorna Wooldridge said. "You feel like your living a piece of history. To be able to bring people here...who haven't been here since they were at school. It's just the neatest thing." 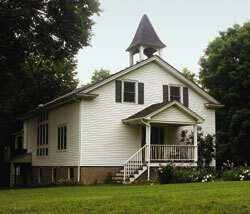 The schoolhouse also served as a church for about five years, prior to the establishment of the Free Union Church. The Church and cemetery, directly across the street, recently celebrated its 150th anniversary. It was then that the Wooldridges stumbled upon the original 1835 deed to their home and embarked upon a journey of discovery and learning, befitting the original function of the home. The children involved in the home-schooling project of uncovering and documenting the Free Union Schoolhouse's history range in age from 6-11 years of age. That roughly parallels the 6-14 year old age bracket of the original school. Wooldridge reflected that it is "recreating the one-room schoolhouse experience. We are continuing the history by home-schooling here." With extensive research in local and state history archives, along with interviews of those who attended the school or who have family ties to the school, the Wooldridges and a group of other home-schoolers have compiled enough data to partake in a year-long display sponsored by the New Jersey Historical Society. For Jack, living and being schooled in a 160 year-old schoolhouse is "pretty normal, actually." For the rest of us, it is a thing of a bygone era, erased as easily as chalk from a blackboard. It's not every homeowner who can brag about ringing the bells in his belfry. But Jim Chirip and Heather Motoyka, of Green Township, can. After all, they live in the renovated Greendell Union Church, which still has a bell tower, complete with bell, intact. "You ring the bell from the living room," Chirip says "It's not a little bell." And the bell tower comes complete with resident pigeons. Originally, a bell would have been rung to summon the community to worship and the children to school. The building was deeded to the Green Township School District in 1866 to serve as an academy and a place of worship. It was deed-restricted from any other use and for many years proudly served in its dual role. But that was then. In 1973, the Green Township Board of Education came to realize that they held one-half interest in the shuttered building on Route 611, used only for storage by the local fire department. Sometime after this, the building was sold into private hands and ultimately, around 1996, converted into a home. The building, however, had already undergone many changes pre-1973. According to photographs provided by local residents, the church/school was originally a full two stories tall, with a fieldstone basement. The ground level served as the church. The school was on the second floor.The second story was long gone prior to 1973. Photos from that date show the 30x60 foot structure with tall rectangular windows, the bell tower and the fieldstone foundation, and appearing much as it does today. By contrast, earlier photographs show no windows in the basement level, and a different bell tower perched atop of the missing second story. What is known is that the building stopped serving as a school in 1922, when the school system was consolidated. It could have been then that the second story classroom was removed, leaving the church level below. Chirip has not yet uncovered the date of the last church services, or any references to what became of the second story or why it was removed. The previous owner, Chirip says, took the long vacant building and gutted the inside, designing a home that in many ways still resembles a church. With vaulted ceilings and the second story balcony room overlooking the open floor plan below, and the side staircase and tall windows gracing the first floor, it is not hard to imagine being in a quaint country church, with the choir loft soaring above. There never was, however, a second floor choir loft. The choir loft sat to the left of the altar on the first floor. The back wall, against which the altar once stood, now lets in the light with full windows and French doors opening onto the deck. The open floor plan, with no dividing walls, contributes to the air of being in a church. "It's really neat. We know that the choir loft was where the kitchen corner is. The pulpit was where the back door is. The whole upstairs...that was a ceiling," Chirip explains. The renovation, which created a balcony level and vaulted ceilings, added to the ambience of the existing church architecture- tall windows and the belfry- to create a modern home that genuinely reflects its past use. It is this factor that Chirip most relishes in his home. "It's very comforting," he said of the atmosphere that embodies the home. "We know it is one of a kind." He believes it may contain a few spirits who also take comfort in the old church. "There's got to be spirits. You think of how many people were baptized, married and buried there. It's a place...a social place."